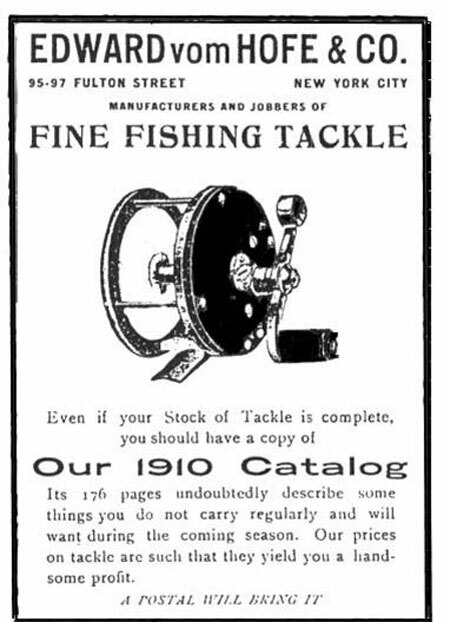 Their catalogues contained vast quantities of tackle that could be split into the following categories; rods, fishing accessories, reels made by other makers and their own made reels. This article will concentrate on the reels that they made themselves. The Vom Hofe family originally came from Germany with the father, Frederick, arriving in America via Ellis Island in 1847. He settled in Brooklyn in an area known as “little Germany” and the following year the rest of the family joined him. Two of his sons, Julius born in 1836 and Edward Charles, born in 1839, were destined to become reel makers. It is possible that the father started making reels in 1857, his son Julius claiming in later catalogues that he had been making reels “since 1857”. In 1867 Julius Vom Hofe, residing at 230 Graham Avenue, Brooklyn, New York, took out the patent for improving the running of a reel and reducing potential rattle in the reel. This improvement was by means of a rigidly secured bridge with a tube going through it which formed the bearing for the drive shaft. The end of the tube was threaded to take a cap cover in order to oil the reel. This was the same year that Edward claimed to start his own tackle business at 102 Fulton Street, New York. In 1880 he moved the business to 97 Fulton Street and about the same time his brother Julius set out on his own, making reels not only for himself but for other retail outlets. 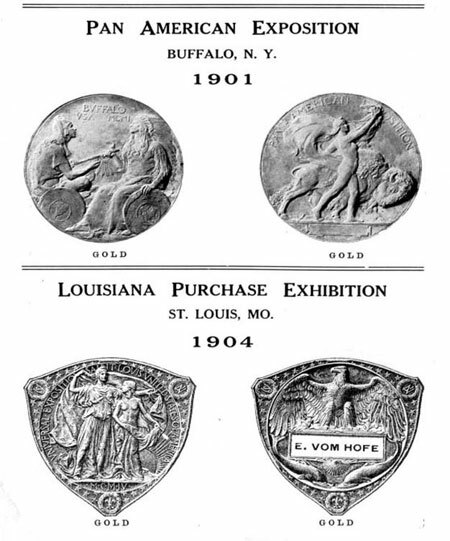 The company entered only two exhibitions resulting in two gold medals. The first catalogue that I have is for 1889 showing the address as 95 and 97 Fulton Street. In the introduction he claims to have been making tackle for 25 years giving the start up date of the business as 1864. He points out the fact, that like many of the famous reel makers, he was a practical fisherman. Consequently he knew what the anglers requirement for tackle was. I think that this would be a good point to mention reel size’s. Not all parts of the world follow the same system, with some adopting a number to indicate a size and some the actual size in inches. The table in the next column gives the sizes used by Edward Vom Hofe throughout his catalogues and the corresponding size in inches. It also gives the recommended line capacity used on various reels. This has to be interpreted because obviously the 16/0 was capable of holding miles of ultra fine line, but you could not land a tarpon on ½lbs. breaking strain line. It must also be remembered that like many manufacturers at the time they were quite prepared to make special order reels and special sizes. There are two sizes not on the list because they do not feature regularly. The size 20/0 reel was in fact the same size as the 16/0 but with a wider spool. Size 5/0 was the early offering for the Restigouche at 4¼ inches but this was later moved up to a 6/0. There is a Tobique size 5/0 in Angling Auctions but I am assuming that this was a special order as it is not catalogued. One other possibility is that it was made in the 1950’s by the Ocean City Tackle Manufacturing company based in Philadelphia that took over the Edward Vom Hofe name. The first reels that were catalogued did not have a model name but a number. This practice was continued in later years even after reels had been given model names. These model numbers also helps in dating reels. The very first reels did not have the model number or size stamped on the foot. The only way to date the reel would be by the use of various patent stamps and examples that have surfaced with presentation dates on them. This does prevent problems, because unlike Britain where a patent stamp is only applied for 16 years, in America reels sold in the 1920’s would still be showing the 1896 patent stamp. One possible explanation given to me is that the oil port covers could have been made in large quantities and not used for many years. That however does not explain everything. I have seen reels with the 1902 patent date and the Philadelphia makers mark. They moved to this location in 1940. It is almost certain that Edward started off making reels similar to his Father and older brother. There are examples of his reels with his brothers patent of 1867 stamped on the oil ports. The idea of stamping the Edward Vom Hofe name on the oil ports has, during the passage of time, almost become his trade mark. The one thing that was to set him apart from other makers was his use of the material Ebonite and German Silver. Introduced in the early 1870’s these would be the predominant materials used, almost to the exclusion of all other, for the rest of the company’s life. Now this would be a good time to clarify what these materials are. Edward Vom Hofe called the materials “extra fine quality hard rubber and German Silver”. Later in another catalogue this would be described as having been turned on a special lathe from “solid gutta percha blocks”. This is the same description used by Otto Zwarg in his 1947 catalogue. Gutta Percha was the material also used in the manufacture of early lures and golf balls. I have also heard it described as Vulcanised Hard Rubber and what in England is termed as Ebonite. I decided that a day at the local university library would clear up what the materials actually were. It certainly was not Gutta Percha. This natural rubber comes from a family of trees native to Malaysia, Borneo and Sumatra. The rubber is produced by maceration of the leaves with hot water. This rubber is not suitable for use in the making of fishing reels. Hard Rubber can also be called Ebonite or Vulcanite both names are correct. Having used the name Ebonite for many years now I shall continue to do so. It is formed by prolonged vulcanisation of rubber with sulphur. This is an extension of the technique used to manufacture car tyres, only more sulphur and heat being applied. It is still manufactured today but is losing out to the new synthetic plastic resins. It’s desirable properties are hardness, chemical resistance, ease of machining and attractive appearance when polished. It’s main disadvantage is the fact that it can discolour in exposure to air and water, a costly lesson I learnt many years ago when I washed solvent off of an ebonite reel in warm water, only to watch in horror as it turned a chocolate brown. It is also susceptible to brittleness, most of us have seen Ebonite reels with cracks where the screws have been overtightened or the reel dropped. With the addition of various pigments different colours can be produced. I have read that the best reels had parts that were turned rather than cast, this is I believe a fallacy. All reels were made from turned sheets of ebonite. Any other method would be just too costly, the production of ebonite is a long slow process. Mouldings would only be suitable for large batch produced items, such as smoking pipe stems or tool handles. German Silver or Nickel Silver are both the same thing. It is an alloy made from copper, nickel and zinc and can exists in a variety of forms from 60 – 65% copper, 7 – 30% nickel and the balance zinc. German silver of the type used in the manufacture of fishing reels is the same as that used in the jewellery trade for the manufacture of articles to be plated such as tableware, costume jewellery and hollow ware. The composition of this alloy is 65% copper, 18% nickel and 17% zinc. The addition of nickel to copper has a whitening effect changing the colour from a yellow white to pure white once 15% has been added. This material is ideal for marine fittings. So we have two materials both corrosion resistant, good looking and relatively easy to work – ideal for making high class fishing tackle. The first patent granted to Edward was in September 1879 for a tension device. This consisted of a wheel that acted on a bow spring that in turn acted on the spool. By increasing the tension the resistance on the spool would cause a running fish to slow. This patent number is seldom seen stamped on reels but the invention, in it’s various forms, was used on the majority of all reels that the company made. The first reels in the 1889 catalogue were two reels described as his “Celebrated Trout and Bass Fly Reel” available in five sizes, ‘S’ shaped handle, steel cogs and springs and E.Vom Hofe’s sliding click drag, Patented Jan. 23 1883. The sizes were 5, 4, 3½, 3 and 2. The model numbers were 350 and 355, the difference being that the 355 was bound with German silver around the rims. This reel was also offered in aluminium as a special order for those who could afford to pay for it. It must be remembered that at this particular time aluminium was a scarce and valuable material and was used to make reels even lighter The 355 would in later years be called the Peerless, one of the world greatest and most desirable fly reels. It is strange that the patent granted on January 23 1883 was awarded as there were certainly many other makers, not only in America but also in England who were using this device on their reels. Despite this Edward’s application was successful, the reason being that he claimed some subtle changes. 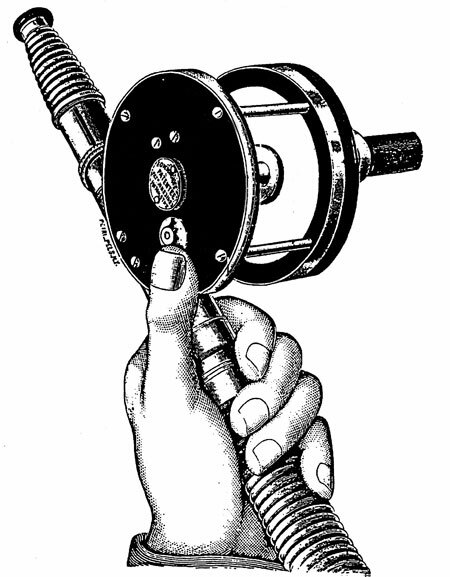 The illustration on the preceding page shows a reel being held in the left hand with the thumb positioned ready to use the check button. Edward claimed that by positioning the check button on that side and the handle on the other the fisherman could control the winding handle with his free hand. This was the combination that Edward claimed was so unique that it deserved it’s own patent. The idea was that if a fish was hooked the fisherman could engage the check on the reel with his thumb whilst holding the rod. Alternatively, he could disengage the check with his thumb or finger if he wished to do so. The construction of the check springs were the same as he had used on the 1879 patent. The next two reels were designated the 403 and 413 Salmon and Grilse Click Reel and available in three sizes. These were 3/0, 4/0 and 5/0 and differ from the sizes shown in the table. The 3/0 was 3¾ inch, 4/0 4 inches and 5/0 41/8 inches. Line capacities were 75, 100 and 125 yards. These sizes would only be used for a few years changing around the turn of the century. The 413 was nickel silver bound and the 403 would only last for a few years before being dropped. 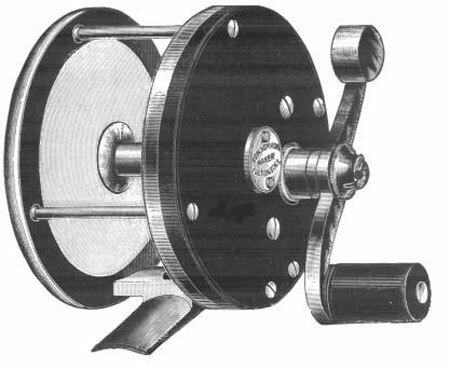 The next reel was the famous model 423 and was the only reel in the catalogue that boasted both the 1879 and 1883 patents. The tension wheel on the first model was operated by means of a pin-in-detent but this proved clumsy and was replaced with a wheel. The full description was the “Celebrated” Salmon and Grilse Click Reel and, like the 403 and 413 was offered in the same sizes. Model 423 Restigouche with pin-in-detent adjustable drag. It also had an extra roller pillar fitted back and front to protect the fly line. The 5/0 at the time sold for $35, an astronomical price for fishing reel. Compare this with the all brass Hardy Perfect of the same size which sold for £2 : 5 shillings. 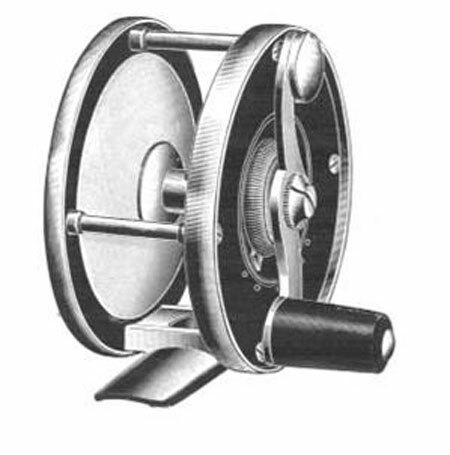 This reel in later years would be called the Restigouche and was the best selling of any of the E.V. Hofe’s reels manufactured. Edward Vom Hofe model 464 Regal reel. So far all the reels mentioned were fly reels with single action. The next section covered the multiplying reels. First of these were model numbers 454 and 464. The difference again being that 464 had German silver bound rims. These were called the “Celebrated” Black Bass Reels and were in four sizes 4, 3½, 3, and 2. One feature mentioned for the first time was the sliding oil cap, another being the balanced handle. Later the 464 would be called the Regal. The multiplying ratio was 3 to 1, very free running and was designed for minnow casting. Edward vom Hofe model 471 Pasque with no German silver binding. Model 471 and 481 had the same name, the “Celebrated Stripped Bass and Tarpon Reel” available in four sizes 1/0, 2/0, 3/0 and 4/0. Like the Regal they offered the sliding oil cap, ‘S’ shaped balanced handle and a multiplying ration of about 3 to 1. Another feature was the handle that could be screwed off. The size 4/0 was the reel that had been specially adapted for Tarpon fishing being lighter and stronger than any other reel offered by the competition. The 471 was without the nickel silver binding and would like all the other reels with no binding be dropped from the catalogues early in the 20th. century. The 481 was later be designated the Pasque. It appears the only difference between the Pasque and the Regal was the size. Both reels had exactly the same feature and both claimed to be free running, strong and light. The last reel in the catalogue was the model 501 the “Celebrated ‘Star’ Rubber Reel” and was available in sizes 1/0, 2/0, 3/0 and 4/0 This was also the most expensive with the smallest costing $32 and the 4/0 selling for $43. The model was also the first reel to be referenced by it’s name rather than the model number. It certainly was the “star” reel in his catalogue. 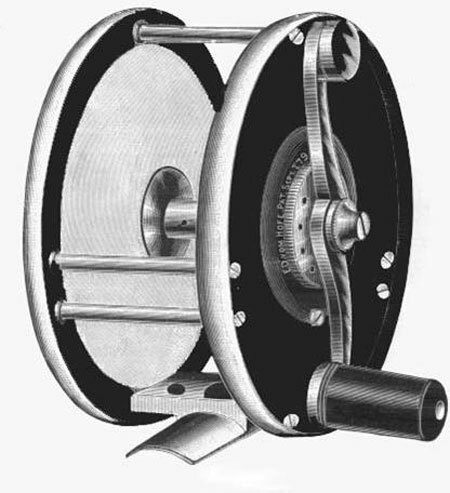 Edward claimed in 1889 to have been making this reel for twenty years. This would give a date of 1869, but was he using ebonite for it’s construction? This was first and foremost a sea reel that had during it’s twenty year life, been subjected to various improvements. It was also the only reel in the catalogue that was “manufactured for my custom trade”. It would in the forthcoming years see many more improvements. In 1896 Edward applied for, and was granted, a patent for an automatic tension drag also called the universal drag. This was a major improvement in fishing reels. It was operated by a simple lever throw mounted on the top of the backplate of the reel. The beauty of this invention was that as soon as a running fish set off, the drag could be applied by pushing the lever. When retrieving line the drag was inoperable. This drag could be adjusted on the single action reels but on the multipliers was either on or off. In May 1902 Edward’s last and most significant patent was granted. This was for “The Edward Vom Hofe Adjustable Friction Drag”. Designed to overcome a major problem in big game fishing, that of applying too much pressure in trying to land a fish. The angler would control the fish by applying pressure via the bending rod and had no need to touch the reel. Once the pre set tension had been reached and the angler continued to bend the rod, the reel would automatically release line. With the fish running the winding handle would stay still. Prior to this the handle would have whirled around with the angler attempting frantically to try and stop the fish running and the handle turning. One story is that Edward invented this after having his fingers broken trying to stop a running fish! To adjust this drag a key was supplied and the reel adjusted accordingly. In the 1907 catalogue the model 350 had been dropped. The 355 had two sizes added, the 1 and 1/0. The silent tension drag was also added and the aluminium version was now held in stock rather than special orders. A new introduction was destined to be a classic, the model 360, later to be called the Perfection. This reel was offered in seven sizes 5, 4, 3½, 3, 2, 1, and 1/0. The full description was ‘The “Edward Vom Hofe” “Celebrated” Trout and Black Bass Fly Reels with Adjustable Automatic Silent Tension Drag. Extra Fine Quality Rubber and German Silver, with German Silver Safety Bands. ‘S’ Shaped Handle, Steel Clogs and Springs, E. vom Hofe’s Sliding Click Drag.” The reels were also made in aluminium and available from stock. Model 360 Perfection fly reel with adjustable drag. In the next part we will continue with the story of the Edward Vom Hofe Company and show how to correctly date the reels. It has however been poorly treated.Are there still parts available for this reel? For instance foot is broken. Are there still parts available for Prestouge 1/0? I doubt if there are many original parts left, there are a few people who are capable of restoring these reels. I own a Restigouche 423 E. Vom Hofe 6/0 salmon reel, previously owned by a direct descendant of Lewis Rutherford Morris. signer of the Declaration of Independence, (also, Dr. Lewis Rutherford Morris). The reel is in excellent condition, and is in its original leather case with the Mill’s and Son’s registration tag. Would be appreciative of an estimate of the retail value, considering the description to be honestly accurate. Could you give me their details? I have a Julius Vom Hofe reel in good working condition.On the star drag it has a patent date of Mar 21.11.Under the reel clamp it says 4/0 and b637.On the left plate in the metal center is written.Julius VomHofe N.Y. and Ocean.Someone had scribed their name on the left bakelite plate also.What is this reel worth and how can I sell it? I have a copper tackle box said to be made by Vom Hofe in aprox. 1889.. Fulton St. NYC, I would like to find out more about it.. I recently found an Edward Vom Hofe 355 fly reel in size 3 1/2 which has a flat back with a screw off bearing cap rather than the usual stamped sliding bearing cover. The foot is stamped 355 and 3 1/2, the front plate and crank are EVH 355, and the check button on the back is EVH. Has anyone eve seen an EVH 355 with a flat back and screw off bearing cap? I ahve acquired today a Edw.Vom Hofe 3 1/2 reel in really good condition and was wondering if anyone has an idea of its value. It has the standard lubrication covers that rotate to reveal the oil ports, both of which are stamped Edw vom Hofe, with pat dates of 1883. Does anyone have any information on the value of a Edward Vom Hofe fishing reel PAT. July 1496. It has all parts and has the leather stop. Thanks. I have a model 464 size 3 Edward Von Hofe reel, and was wondering what it is worth? Does anybody know anything about this model? Thanks for your help. an edward von hofe rod is in my hands… octogan and not a fly rod… anyone interested.. Need two posts, for 60 Pat. 5-20-02 No. 621 E VomHofe. Please advise. Otherwise in perfect condition. l have a fishing E. VonHofe reel. I say its a bait caster 1 1/2 wide about 2″ height. The holder is 2 5/8 long , brass rod l can see in the middle inside to wear the line fastens on. I was told this is very very early, a serious collector from Florida close to 20yrs now located him on the computer who specializes in VomHofe stated 1500.00 American, a guy in North Bay On quoted 1500.00 Canadian. Both of theses people told me as well very very rare and stated mid 1850. Both of these people also told me that they never seen one like this. They stated they were serious collectors and do alot of shows, infacted they wanted this so bad they phoned evrry week for a couple of yrs. Yes l would like tge real value of this reel. The information below hopes this helps. There is 1 handle is lvory sad part it is split in half gone to when l purchase this real the other part of the reel is a round end. the bottom of the reel to where its sits on the rod states 60 or 09 depending how you read it. There are 2 slots screws fast at the bottom on 2 round rods. There are 6 sloted screw on face side with the biggest is a brass plated for you can see the top brass but the edges are silver. Trying to find informant on von home rod and reel I have the rod is a children’s rod and the reel is a c-1898 1/0 casting real. If you know about it let me know. There is a Greenheart wood boat rod 6′ with dual agate guides. Is this what you have?? If so vlaues depending on condition. Poor to Fair = $95.00, Good to very good = $230.00 and Excellent =$400.00. Not sure if this is the rod you are referring to or not.